Hello Kitty lands at JANM, just in time to celebrate 40 years of being cho kawaii. If there’s any doubt where you’re going at the new Hello Kitty exhibition at the Japanese American National Museum opening this weekend, just follow the little red bows. Hello Kitty’s distinctive red bows dot the floors, forming a walking path between exhibition spaces of “Hello! 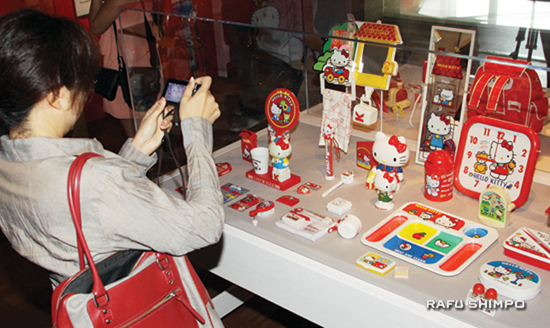 Exploring the Supercute World of Hello Kitty,” the first-ever exhibition devoted to the iconic Japanese brand. The exhibition, which features hundreds of vintage artifacts, is extensive and covers two floors of JANM. All manner of Hello Kitty merchandise, both domestic and Japanese, are on display, including a copy the first Hello Kitty product, a vinyl coin purse. For fans of original Hello Kitty items from Sanrio, the Japanese company that produces the beloved goods, there are large display cases filled with colored pencils, erasers, diaries and backpacks from the 1970s and ’80s, sure to bring back warm memories of childhood. Uniquely Japanese Hello Kitty items include ceramic Hinamatsuri dolls and a map of Japan adorned with Hello Kitty trinkets from different regions. 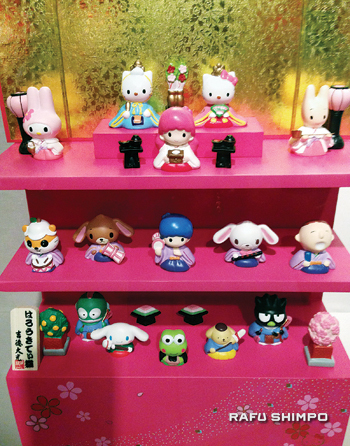 Above, Kitty and friends are set up in a traditional Hinamatsuri (Girls’ Day) display. 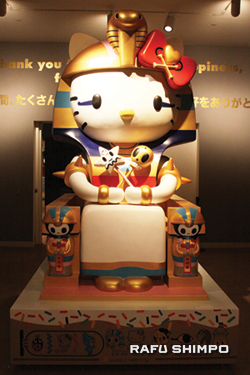 A Sphinx-like Hello Kitty statue forms a thematic gateway into the museum’s original “Common Ground” exhibition. Dr. Greg Kimura, president and CEO of JANM, said that Hello Kitty has a special connection to the Japanese American community, making the museum a natural choice to host the exhibition. He noted that when Hello Kitty first arrived in the United States 40 years ago, young Japanese American girls were the first to embrace the character. 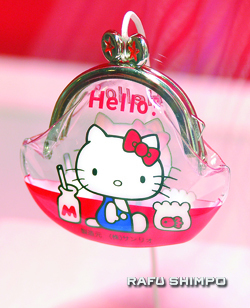 A replica of the very first Hello Kitty item, a small vinyl coin purse with a simple greeting in English. An original will be included in coming weeks. Dr. Christine Yano is curator of the exhibition and author of “Pink Globalization: Hello Kitty’s Trek Across the Pacific.” During her research she spoke with Japanese American women in Los Angeles who grew up in the 1970s and shared their connection with the Sanrio character. “They talked about Hello Kitty with such passion and Hello Kitty was the center of a lot of lives. It affirmed their presence and it was really one of the first pop culture elements from Japan that was doing that,” said Yano. According to Yano, the popularity of Hello Kitty reflected wider acceptance of Japanese culture in the United States, and in turn Japanese Americans. Famed L.A.-based artist Gary Baseman’s interpretation of Hello Kitty. Sanrio president and COO Janet Hsu said the popularity of Hello Kitty endures due to her ever-evolving status as a true pop culture icon. She also addressed the question that has garnered a fair amount of attention in recent weeks, after a report that the character is in fact a girl, and not a cat. 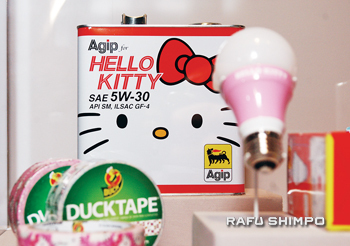 Hello Kitty’s appeal has reached many facets of modern life, including household items such as appliances and even motor oil. “She is Hello Kitty, and that’s who she’ll always be,” Hsu said. Hello! 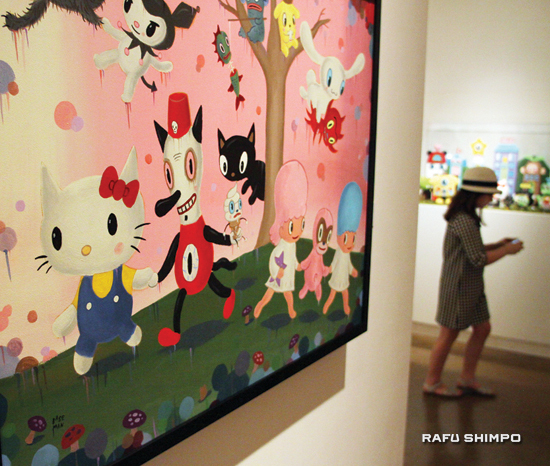 Exploring the Supercute World of Hello Kitty” is on view from Oct. 11 to April 26, 2015 at the Japanese American National Museum. Adult admission: $20; children 6-17, $10. Free for museum members. All admissions are based on timed entry and advance purchase is strongly encouraged. Tickets are available online at janm.org/hellokitty.